Haunted Houses in Los Angeles, California. are some of the scariest haunted houses in America. Hauntworld.com tries to review only the best haunted houses in Los Angeles, California. When you are looking for simply the best, scariest, haunted houses in California there is no other place to search than Hauntworld.com which offers our guests the best information to find California Haunted Houses including the best haunted attractions in Los Angeles, California There are many haunted houses in Los Angeles that claim to the best haunted attraction but only one can truly lay claim to the being the scariest haunted house in California... Knotts Scary Farm Haunted House in Los Angeles, California. Since 1973, Knott's Berry Farm in Buena Park, California has been conjuring up it's own Halloween tradition. 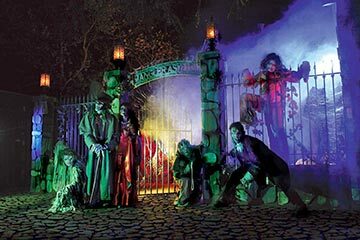 That was the first year the Southern California theme park cloaked itself under the moniker Knott's Scary Farms Halloween Haunt and launched its Halloween Haunt, the First Halloween Theme Park Event. Building slowly over the years, the event now covers 160 acres, lasts 25 nights and boasts over 1000 live monsters roaming the park. How did Knotts Scary Farm achieve the grand reputation they have today? What is this Haunt doing right? More importantly, what can smaller Dark Attractions across the country learn from the Knott's Scary Farms Halloween Haunt? There is no magic room design or any one scheme that makes a destination this popular. Instead, it has been a slow build and cultivation on many levels that make the Knott's Haunt such a success. Key factors include Innovation, Tradition and Design which all contribute to making the Knott's Haunt 'to die for'. Thirty years ago, Halloween was the season to dress up and Trick or Treat. For a multitude of reasons, the years to follow witnessed a decline in these traditional Halloween activities. In retrospect, whether intentional or not, the Knott's Haunt concept marked the beginning of a turning point in our culture; the decline of Trick or Treating and the rise in popularity of centralized Halloween events. Knott's took an innovative approach at the right time, and created a new reason to visit the Berry Farm. Merely a 'seedling' in 1973, the past 31 years have allowed for consistent promotion, implementation and execution of this event. Neither glamorous nor earth-shattering, tradition plays a large role in the event's widespread and longstanding success. Consider the latest Census statistics that conclude 50% of the population will live their entire life within 50 miles of their birthplace. This could very well explain the park attendance that jumps from one age demographic to the next. While kids under 18 were the dominant age group, guests in their 30s and 40s and up were well represented. Los Angeles and Orange County has a combined population of 3.5 million kids under 18. No wonder Knott's Scary Farm offers 25 nights, (many Sold Out during that last weeks of October). Starting them young, Knott's also has a non-scare celebration designed for the family crowd. Throughout the Camp Snoopy section of the park, the Annual Camp Spooky is held during the day (now in it's 13th year). This daytime event permits kids 3-11 to Trick or Treat through the park as part of the regular admission price. Start a tradition early with this group and the potential number of return guests multiplies. For many young grandparents, moms and dads, young adults, teens and 'tweens living in Southern California, Knott's Scary Farm IS their Halloween. The overall design of the Knott's event is really a critical factor to its success. For starters, Knott's IS haunting for the masses. 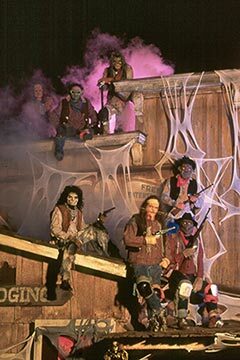 The attraction line-up for the 2004 season included 11 Mazes, 4 Scare Zones and 6 Themed Shows all for $46 bucks. (Of which you could get up to $23 off with sponsor coupons). While individual Haunted Attractions can be quite popular in North America, Southern California is quite devoid of these stand-alone venues. And it's no wonder! Crowds or not, this is a great price for an entire night of scares. At $23 it would be difficult to get into any two separate events elsewhere. 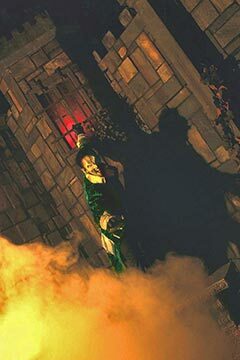 An entire night of entertainment and amusement, with more special haunted attractions than one could see in an evening, is a tremendous value for the Haunt-goer, and puts Knott's in the 'untouchable' category for anyone even thinking of competing. Knott's also has the ability to open up non-Halloween themed rides too. It is beyond me why anyone would attend this Halloween event to wait in a 2 hour line for a ride when you can attend the park in the day and have no wait at all? Either way, Knott's is accommodating to those riders and is a great strategy to alleviate the crowd pressure amongst the street. They really are operating at full capacity in the middle of the night. Success Tip: Have other types of attractions available to guests that don't want the full Halloween Experience. The economics and crowd logistics' are just the beginning of the Knott's design. The mazes themselves are methodical in layout and design as well. For the most part the mazes lead the guest along with a particular theme already set. The events that unfold are not unlike a roller coaster with planned anticipation, quick actions, high impact scares followed by sections of coast or escape. This analogy exemplifies the emotional ups and downs as they journey through the mazes. These short bursts of high energy scares, followed by black wall sections of non-descript scenic allows guest to reflect what they have just experienced and calms them down for the next set of scares. Startles along the way are used to build the anticipation. Every room does not have a huge scare and that's good design. Success Tip: Pace out your scares to allow the guest to experience highs and lows of the story you are telling. Red Beards Revenge was a twisting, cavernous tour below decks of a cursed ship. Haunts really didn't pick up the pirate theme just after the movie release of Pirates of the Caribbean. Knott's did and this maze had a grand entry façade with animations and overflowing sets filled with scenic detail and lots of pirates. The journey below the ships decks and the "rocking" of the floorboards were details I admired and remembered. This maze possessed a strong story line that was easy to follow due to the recent movie and was augmented with "full of life" characters. I thought they pulled this off well. There was a sense of dank confinement and the overhead space left you thinking you were below the decks. Twisting and winding around the sets, this story line was filled in by your own interpretation of what a pirate's life would be. Success Tip: Use current day entertainment to keep the show fresh and your guests interested. Another well-done maze (and my favorite) was Terror Vision in 3-D. Leading you down a hall of white noise, this maze was based on the kitschy 50's, 60's and 70's TV shows that we all grew up watching. Immediately recognizable show logos were doctored up with creepy themes like Sesameat Street, UnHappy Days, I Loathe Lucy and Wheel of MisFortune. After the simple 'cue card' intro, guests toured a replica set for each show while twisted theme music played in the background. The spoofed scenes were enhanced with a horror twist. This design really worked as recognizable characters and familiar scenes led guests into a false sense of security, only to set them up for the scare. A manic mix of animations, static props and clever actors, this maze was scaring everybody just about every four feet. Because the layout was designed in such a way that each room was introduced with a brand, guests focused on what they expected to see, and were easily distracted. Success Tip: Use the viewer's memory to distract or take them back to a moment that they can reflect on. Suffice to say this is not a maze revue, but most of the 11 mazes I journeyed through were well done and at the very least had clever aspects of design and show value. Both Red Beards Revenge and Terror Vision in 3-D, like all Knott's mazes, were short, twisting paths of high impact and energy. No real pulse of the guest throughput was evidenced, and most times it really didn't matter. Another key to their design is the application of actors that did not attempt to scare every guest that passed. This restrained shock technique employs the concept of quality and not quantity scares. A balanced smattering of shaker cans, canastas and metal finger tipped gloves allowed the actors to control their use of sounds to startle and elicit the imagination, as opposed to a heavy hand slapping on plywood walls. Success Tip: Subtly can be just as effected as in your face. Continuity was seen throughout the Haunt. Designs and themes are introduced by the Marquee or façade treatment and carried throughout the mazes. This is important to set the plot in the guests mind and initiate a mood. While many Haunted Attractions elsewhere comprise a "Haunt Stew" approach (where each room or scene is comprised, based on the props/actors on hand rather than an actual story line), sticking with a theme allows for designers to fall back on continuity and permits the guest to be set up more easily. A typical Haunt Stew Scenario would be a circus scene followed by a dungeon set followed by an Alien spacecraft, etc. Knott's sticks to a storyline. These mazes also tend to scare forward and actors are smart enough not to block a guests egress path. This is key to getting guests into and out of the maze. With so much to do, who wants to get stuck in a bottleneck for 5 minutes? Success Tip: Always permit guests to 'escape' from a room as quickly as possible to make way for more guests. Scare Forward whenever possible. With this said, I hope Knotts can learn from a mistake. Billed as a "Scare Experience" the Jaguar - Temple of Sacrifice appeared to be another haunted maze. After entering the interior attraction, our group was immediately stopped by what appeared to be a temporary bottleneck. It's wasn't. This "scare experience" was actually just a Queue line for a less then mediocre kiddy coaster with a couple of sadly concealed scare actors trying to remain motionless while guests stood within punching distance. The real tragedy was by the time I could see what I had gotten myself into, there was no way out and the guests demise was to shuffle along a never ending switch back queue until boarding the coaster. Success Tip: Don't try to scare waiting guests unless there is a way for the actor to escape and reset elsewhere. While I may never get those 30 minutes back, the "scare zones" somehow made up for it. These concepts really work and most haunted events attempt these in some form, but typically not at the scale of Knotts. Whether nestled underneath the forested walkways of Camp Snoopy, (the Gauntlet), below the twisting steel of massive coasters, (The Swamp), or ambling down the dusty western boardwalk, (Ghost Town), a total of 4 zones offered up ample opportunity for scares. These 'zones' are all about the guests freely roaming around the open common areas or sets of the theme park. While taking in the sites, shopping or goofing off with friends, the guests are actually being stalked. These areas are where a lot of the roaming monsters lurk, waiting for the unsuspecting and distracted. One of the best features of this event is watching other guests being hunted by the monsters. This is a front row seat to witness a hideous creature prowling for an unsuspecting group of teenage girls. Or a pair of thirty-something's juggling sodas and churros as an onrush of sliders rush out of the fog-choked corners of the street. This side show entertainment occurs independent of the mazes, has every guest on edge and is great fun. Success Tip: Haunt common areas outside of the attraction for added value. Sliders, a subset of the roaming monsters, are another great innovation that converts passive areas of the park into a separate attraction. Sliders are roaming monsters of all types that are suited up with leg, knee and elbow pads. Their heavy work gloves are fitted with steel fingertips and plates to protect them as they take a running leap towards guests and slide - stopping short right at the feet of the targeted victims. This type of fast action scare leaves nobody safe from attack. Success Tip: Employ Hit and Run scare tactics that leaves guests wondering what will happen next. These scare zones have earned their own right to entertainment and guests now pony up to pose and buy a staged photo (after the scare of course!) with their favorite monster. While the purest of haunters would cringe as monsters chat with guests while in costume, remember, this is haunting for the masses, (and really with crowds like these, anything goes.) Kiosks are set up with cash registers and lighting, ready to capture you and your favorite creature, for a price. Another revenue source for the park is the "Seasons of Screams" series that is now out on DVD. This Hauntumentry reveals the history of the Knott's Scary Farms Halloween Haunt and how it evolved into the most successful Halloween attraction in the World. Success Tip: Offer DVD's or photos so guests can take home the experience while providing additional revenue. The latest innovation is the Maze Interior Photo Opportunity. While this may be the single worst place to have guests dig around for a flash camera, it may be visionary with regard to the current popularity of camera phones. This concept allows the guest to stop inside the maze, whip out a camera and pose with the characters as they are in the set. Typically one would think that photos would be taboo, but the vampire brides overtly encouraged shutterbugs within their reach. How this would work on a busy night, I have no idea, but if you're stuck in a backed up line, it may just prove to be entertaining and encourage more interaction among guests and actors. This strategy may also accommodate a slow maze section or allow time for guests to slow themselves down so they don't trample lagging groups within the maze. There is much more to the Knott's Haunt then I have space to cover. This event really is a great place to research the art of haunting. Several rides at Knott's are also transformed into haunted attractions that are unique and fun. Between attractions you could also take in any of the 6 "Sinister Shows" that are produced just for this season. Ranging from the traditional 'Hanging' to the newest offspring "Dr. Cleaver's Psycho Circus", these attractions are peppered with current events, comedy and gore. Dr. Cleaver's was evidence of Knott's leaning to a more adult theme show that had big stage effects and Vegas style dance numbers. Success Tip: Take a chance on new concepts and ideas and be quick to learn from your mistakes. Innovation, Design and Tradition have all lead to the success of the Knott's Haunt over the years. A lot can be said of being first to market with new scares and maze concepts, but there is more to it then that. The designing of an event that permits guests to experience fear in fast paced, energetic environment gets them in and out of the mazes and on to the next thing. Knott's keeps people moving from event to event. Offering more then any one guest can experience in an evening leaves the audience wanting more and that is a golden rule in entertaining, which Knott's easily accomplishes. Most importantly, Knott's Scary Farms Halloween Haunt is building traditions with its audience, young and old, and that will keep this new era Halloween around for years to come. Michael J. Chaille is the president of Ghost Ride Productions, INC., a Halloween and Dark Attractions manufacturer based in Hollywood, California. Professionally in the Halloween Props and Effects business for 10 years, Ghost Ride develops a multitude of new products for the industry annually. Part of the business is seeing what is out there and what is needed within the industry. Ghost Ride puts this research to use in developing new and custom products for theme parks across the nation and around the world. Michael can be reached at info@ghostride.com.